WHAT ARE THE BEST ONLINE MASTER'S IN MINISTRY PROGRAMS? What else can I expect from an online Master's in Ministry program? According to the BLS, U.S. clergy members have a median income of $49,450 a year. They are commonly employed by religious organizations and hospitals. If ministry work is something that you've considered, we've collected information on the best online master's in ministry programs in the country. Graduates can find employment throughout the country. Common job responsibilities include performing at religious ceremonies and providing guidance and assistance to followers. Faith and religion are constantly evolving, much like the societies in which they exist. By earning an online master's in ministry studies, you can develop the skills to contribute your own unique voice to this larger conversation while continuing the work you're already doing. Some graduate programs have specific previous requirements, while others only require a bachelor's degree. If you do not have experience in ministry or a related undergraduate degree, you may have to prove to the school that you would be a good fit for the program by showing how your interests and experience have prepared you for it. 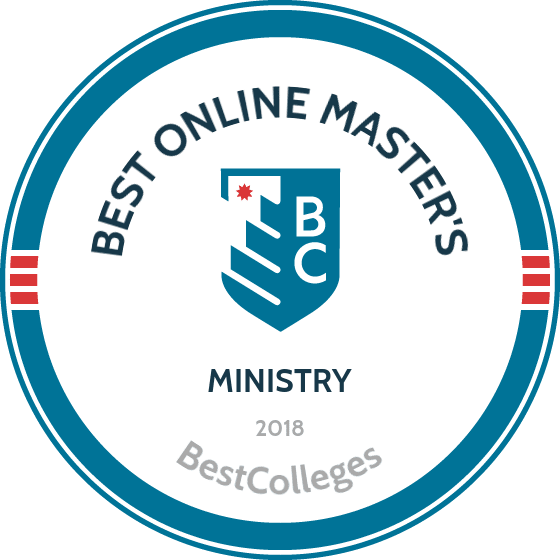 This list ranks the best online master's in ministry programs based on several factors, but they cannot account for your personal situation. Consider factors such as cost and schedule, but don't forget to think about what you want from the degree. Programs will have different teaching styles. Some programs will require you to log on at certain times and require you to complete on-campus sessions, other can be completed entirely online at your convenience. Some programs are also taught through a cohort format, which has students move through the curriculum together and provides a more traditional feel. CAN I WORK WHILE I COMPLETE MY ONLINE MASTER'S IN MINISTRY? Online programs are often designed with working professionals in mind and allow you to complete coursework based on your schedule. Some programs are more demanding than other and might require full-time enrollment. If you plan to continue working while earning your degree, prioritize programs that allow part-time enrollment. Luther Rice University & Seminary is located in Lithonia, Georgia, and offers two graduate-level ministry degrees online. Students have the option to pursue a master's of arts in ministry or a master's of divinity, both of which cost $252 per credit hour, one of the lowest rates among private universities in the country. Students in both programs gain a solid foundation in biblical literature and theological philosophy, and also build communication and leadership skills. The MAM program emphasizes family counseling and administrative support and is ideal for those interested in becoming a spiritual leader in their community. The MDiv is designed for those who want to take their work on the road as missionaries or military chaplains. In this program, students study Greek and Hebrew, as well as biblical and church history. The school offers several varieties of financial assistance, including need-based scholarships and military tuition assistance. New Orleans Baptist Theological Seminary is a renowned institution of higher education that was established in 1917 as a gateway institution to Latin America. NOPTS offers several academic programs to distance learners, including an online ministry degree. The master's of arts in pastoral ministry is a 37-credit-hour program that can be completely entirely remotely, or through a combination of online coursework and study at the main campus or one of the school's extension centers. Students in the MAPM program study family counseling, urban rejuvenation, and youth culture. The curriculum prepares students to serve as a pastor or support staff of a local church. Students at NOPTS have access to academic advising, employment services, and financial aid. NOPTS is also one of the only pastoral schools in the country with dedicated programs for Korean students. The total cost for a three-credit online course is $960. Located in Wake Forest, North Carolina, Southeastern Baptist Theological Seminary enrolls over 3,400 students annually and offers more than 40 academic programs, including an online ministry degree. The master's of divinity, the school's flagship program, is designed to teach students the necessary skills and knowledge to become missionaries, pastors, and evangelists. While online MDiv students may concentrate in a wide variety of specialities, the Christian ministry track is the most popular because it allows for the largest number of elective hours on top of the core coursework in church history, theology, and literary interpretation of scripture. Students at SEBTS have co-educational and professional development opportunities offered through the school's Biblical Women's Institute and the Global Theological Initiative. The school offers many military, state-specific, and institutional scholarships, and is home to several Christian conferences, like Defend Your Faith and Truth & College. Payne Theological Seminary is a small private institution that was founded by the African Methodist Episcopal Church in 1844. The school enrolls approximately 150 students annually and offers two academic programs, a master's of divinity and a doctor of ministry. The master's of divinity consists of 90 total credit hours can be completed in three to five years through a combination of online and residential study. The MDiv program at Payne stands out from other online ministry programs for its Afrocentric curriculum. Students take courses in African American religious experience and the history of the black church in the North American context, and more. In addition to core coursework, students are required to participate in a year of guided experiential learning in a church and non-church environment. Through Payne's many partnerships with organizations like the Princeton Theological Seminary and the Interdenominational Theological Center, students have plenty of opportunities to build their professional networks. Luther Seminary is located in Saint Paul, Minnesota, and was initially founded in 1917 through a series of mergers with other institutions in the Twin Cities area. Today the school offers a number of online ministry programs, including a master's of divinity. Students may choose to complete their MDiv through the online or "Distributed Learning" format, which enables them to take two-thirds of their coursework remotely and the remaining one-third through two, two-week intensive residencies. Luther's MDiv program offers seven different concentrations, including: Old Testament, New Testament, history of Christianity, systematic theology, Spanish language for ministry, children, youth and family ministry, and congregational mission and leadership. Experiential learning and civic service are foundations of every program at Luther, and students are required to complete internships and engage in programs of cross-cultural exchange and public leadership in order to earn their degree. Online students pay approximately $15,890 per academic year, with financial aid opportunities available. Wesley Biblical Seminary was established in 1974 in Jackson, Mississippi, as an interdenominational institution that prepares students for careers in ministry. Wesley offers a number of degree and certificate programs, including a master's of divinity in general ministry. The 78-credit program can be completed in three to four years and is offered mostly online with some required on-campus components. The curriculum includes coursework in biblical literature, theology, church philosophy, and topics in practical ministry such as pastoral counseling and principles of preaching. Students may choose to take Hebrew or Greek as general electives. Online classes are hosted in real-time through the Zoom platform. Students can fulfill their residency requirement by taking, weekday, weekend, or one-week intensive courses as well as retreats held in the fall of each year. Applicants must have a bachelor's degree, minimum GPA of 2.5, and demonstrate essential Christian spiritual and moral integrity. Located on a 44-acre campus in Elkhart, Indiana, Anabaptist Mennonite Biblical Seminary is dedicated to teaching religious and community leaders Mennonite seminary. Among the school's many academic programs is an online ministry degree: the master's of divinity connect. This 80-credit-hour program allows students to take the majority of their coursework online, with scheduled visits to campus for hybrid classes and co-educational events. The MDiv curriculum prepares students for careers in chaplaincy, clinical pastoral work, or overseas youth ministry. Students in the MDiv program are expected to attain a level of multicultural knowledge and empathy, using that knowledge on internships with the Center for Community Justice or other organizations. Tuition is $480 per credit hour, and online students can apply for financial aid if they take at least 12 credit hours per semester. Bethany Theological Seminary, located in Richmond, Indiana, was established in 1905 by the Church of Brethren, a historic institution of peace that stands against all wars and works towards peacemaking and reconciliation for all peoples. The school's master's of divinity connections program allows distance learners to complete about two-thirds of their coursework online. Student have the option to take the remaining requirements through weekend or hybrid courses, as well as during two-week intensives on campus. The curriculum includes courses in preaching, worship, and intergenerational group motivation and engagement. It also leaves room for nine hours of general electives where students can further their education in practical ministry, or pursue another focus area like peace or historical studies. Graduates leave the program prepared for successful careers in ministry. Tuition is priced at $480 per credit hour and BTS offers generous financial assistance options, including the Church Service Covenant Grant, which covers 50% tuition. Faith Evangelical College & Seminary was established in 1969 by a Lutheran organization and is an interdenominational institution of higher education. Located in Tacoma, Washington, FECS offers several online ministry programs, including a master's of arts in leadership ministry. This 72-hour program is designed for those pursuing careers in ministry as pastors, support staff, and community organizers. The curriculum emphasizes theology, philosophy, and practical understanding of Christian doctrine at work in the world. In addition to the core curriculum, students choose among three specializations: global leadership, Christian counseling, and life coaching. Students may also work with the school's Korean and Chinese divisions in order to develop a better understanding of global outreach. There are a variety of financial aid options available, as well as transfer credits towards degree completion, and benefits for veterans and military chaplains. Calvin Theological Seminary was established in 1876 in Grand Rapids, Michigan. CTS is linked closely with Calvin College, sharing the same board of directors until 1991. Calvin offers several online ministry programs, including a master's of divinity degree. This five-year program teaches core topics like biblical history and theological foundations of church teachings. Students choose from several concentration areas, including: Old or New Testament, ancient near eastern languages & literature, history of Christianity, theological studies, new church development, contextual ministry, evangelism & teaching, preaching & worship, pastoral care & leadership, and youth & family ministries. Distance learners can complete most of their coursework online, but certain classes and ministry internships require accelerated on-campus attendance. MDiv students are encouraged to pursue co-educational work, like mentorship programs or involvement in one of the school's centers and institutes, as a form of professional development. Bethesda University was founded in 1976 in Anaheim, California. The school is dedicated preparing students for careers in Christian Pentecostal ministry and theology. Bethesda offers a master's of divinity, a program designed to train future ministers and pastors by providing a well-rounded education based in theory, history, and practical training. The curriculum for this online ministry degree totals 96 credit hours and includes courses in Greek and Hebrew, as well as a preaching practicum. Online students are required to take six hours in field education, which requires them to travel to the Anaheim campus or other training locations to participate in retreats or community missions. Online students have access to academic counseling, career advice, and personal/spiritual support. Student may transfer up to 15 credits towards their degree if they have studied biblical or theological studies as an undergraduate. Located in Louisville, Kentucky, The Southern Baptist Theological Seminary was founded in 1859 and is the oldest seminary of the Southern Baptist Convention. Today, SBTS enrolls over 5,000 students annually and offers several undergraduate and graduate degree programs, including a remote master's of divinity. Students with the appropriate background and training may choose to enter one of the advanced MDiv programs, which are accelerated and highly specialized. The MDiv's curriculum includes fundamental courses in church history, practical ministry, and biblical interpretation. This degree stands out among other online ministry programs because of their extensive list of concentration, offering 22 options for MDiv students and 5 options for advanced MDiv students. These concentrations range from biblical spiritualities and itinerant evangelicalism to urban missions and Islamic studies. Distance learners at SBTS enjoy access to academic support and professional development opportunities through organizations like the Center for Student Success and the Mathena Center for Church Revitalization. Amridge University was founded in 1967 in Montgomery, Alabama and specializes in nontraditional and distance education. Distance learning is the primary form of education at Amridge, and the school's entire philosophy and structure is built around optimizing the online experience for students. Amridge offers a number of ministry degrees online through its Turner School of Theology, including a master's of science in Christian ministry. This degree is designed to give students who hold any bachelor's the foundational knowledge and skills to gain entry-level positions in ministry or to pursue PhD studies. The MSCM curriculum consists of coursework in homiletics, systematic theology, and spiritual leadership. Students can customize their degrees through elective classes and must complete a mandatory capstone course. Ambridge University offers a variety of financial assistance, including discounts for law enforcement, first responders, and other public servants. The Chicago Theological Seminary, an affiliate of the United Church of Christ, has trained their students to become spiritual and community leaders for over 160 years. As an interdenominational institution, CTS enrolls students of over 40 different faiths and offers a number of degrees, including a master's of divinity. The MDiv program at CTS focuses on foundational theological areas, as well as self-reflection and transferable leadership skills. This prepares students for careers in ministry, or in outside disciplines like healthcare facilities, nonprofit agencies, and advocacy organizations. Students at CTS are required to engage in field education at several churches and community sites across the United States. This part of the MDiv is designed to enrich the student's education through community partnership and hands-on experiences. The school offers an online help desk to assist distance learners with technical issues. Moody Bible Institute traces its history back to 1870 where the school's founder, DL Moody, saw the need for an institution of faith and service in Chicago. Today, MBI offers a number of degrees, including a master's of ministry online. This 36-credit-hour master's of arts in biblical exposition program emphasizes practical application and creative research. The program trains students to cater to the needs of their community and church through courses in contextualized preaching, church culture, communicating scriptures, and other topics in oratory and engaged service. Online students have up to five years to complete their MABE. A host of student services are offered, including technological support, peer tutoring, and career development help. Moody offers a variety of financial aid options, as well as institutional scholarships and veteran benefits. The Interdenominational Theological Center is an ecumenical institution of education and professional training with a history of service to the African American community in Atlanta, Georgia since 1958. With a mission based in service and afrocentric spirituality, ITC offers a number of degree programs, including a master's of divinity that can be completed either on campus or online. The MDiv program is designed to combine theoretical and philosophical study with practical skill application, and is ideal for those interested in entering the world of ordained ministry. Two-thirds of this 90-credit curriculum may be completed entirely online, while the remaining hours must be completed at the ITC campus either through summer courses or accelerated "early-term" classes. In addition to core and general elective courses, students may choose between two concentration areas: Bible studies or womanist studies. The womanist studies specialization is offered only in a few online ministry degrees in the United States, and is distinctive for its focus on black women and their role in church and community. Apex School of Theology was founded in 1995 in Durham, North Carolina, and has a philosophy rooted in African American history and religious experience. Apex offers a master's of divinity degree that can be completed on campus or online. The 90-credit-hour curriculum focuses on African American spirituality and practice, with courses in "The Soul of Black Worship" and the life and ideas of Howard Thurman, renowned black theologian and civil rights leader. Students also gain practical skills in sermon-giving, pastoral care, and professional and ethical counseling. Apex has dedicated academic support for distance learners through its writing center, library, and center for research. The school also offers assistance to active military and veterans, including financial support and an army chaplain entry program. Tuition for this MDiv is among the lowest of any online ministry degree program at $233 per credit hour. Shasta Bible College and Graduate School is a Baptist institution of higher education located in Redding, California. The school regularly receives acclaim for the quality of their distance learning program. Among Shasta's online ministry programs is a master's of divinity degree that comes in two specializations: pastoral and general ministries. This MDiv comprehensive degree and is suited for those who would like to pursue careers as pastors, evangelists, missionaries, and religious teachers. The curriculum totals 96 credit hours and courses are offered asynchronously, enabling students to access content at their convenience. Course topics range from biblical literature and theology to Greek and Hebrew languages. Students also receive extensive training in pastoral ministry, which includes up to nine hours in practicum. Shasta provides an extensive support network, including specific financial aid for homeschooled students and those whose family are part of the Christian ministry. World Mission University was founded in 1988 as an institution of spiritual and practical education for Koreans and Korean Americans. WMU offers distance learning programs that aim to train students in missionary, pastoral, and lay leadership values and skills. One of the benchmark programs is the master's of divinity, which consists of 93 credit hours and is designed for those who wish to become ordained ministers in the church. Graduates leave the program ready to pursue careers in ministry or in another field like counseling, youth education, and urban service. Courses focus on foundational topics in biblical studies and theology, and students have 23 credits of open electives to customize their studies. There are also 7 required credits in field education that can be fulfilled through service missions or internships. Tuition is $250 per credit hour. WMU offers international students special academic and financial support, including help obtaining their visa. The King's University offers 13 vocational ministry programs, several of which can be accessed through TKU's online through Blackboard. The master's of divinity prepares students to engage with the spiritual and practical needs of their faith communities. The MDiv requires 9 credit hours of prerequisites, which can be satisfied from undergraduate studies: Old Testament studies, New Testament studies, and biblical background and interpretation. The curriculum is largely based in the study of practical ministry skills like counseling, strategic leadership, and effective preaching. TKU's online ministry degree is one of only a few that offers a specialization in Messianic Jewish studies, which alters the curriculum to include coursework in Hebrew, Jewish ethics, and a study trip to Israel. Hands-on engagement is a fundamental requirement at TKU, and are expected to train in specific areas of ministry like pastoral leadership and prayer and prophecy. Heritage Christian University was founded in 1871 as a training academy for ministers and other Christian leaders. HCU offers a 36-credit master's of ministry online. The program is best suited for those who have prior experience in ministry and who wish to pursue further education and training. Students choose one major and minor area of focus from four concentrations: ministerial counseling, biblical studies, homiletics/ministerial care, and history of biblical interpretation and theology. In addition to core coursework, students can customize their studies with 12 credit hours of electives. Distance learners at HCU have access to personal/family counseling, spiritual support, career assistance, and tutoring through the school's Learning Center. Students also have access to service projects and other forms of field education through the Center for Missions Training & Information. Liberty University is the largest Christian university in the world and offers over 200 degree, many of which are offered online. Liberty offers a wide selection of master's of ministry online programs, including a master's of arts in Christian ministry. Facilitated through the Rawlings School of Divinity, the MACM is the most flexible of the degrees, and offers eight concentration areas: community chaplaincy, global studies, pastoral counseling, pastoral ministries, leadership, discipleship and church ministry, evangelism and church planting, homiletics, and worship. Up to 12 credits can be transferred from previous academic work. Distance learners can find support through the Writing Center and the Online Advocate Office, a department dedicated to advocating on behalf of online students. Tuition is $395 per credit hour with several opportunities for financial support, including discounts for military personnel. Military students also have access to book vouchers, specific scholarships, and personalized academic programs. Located in Searcy, Arkansas, Harding University is a private Christian college that was founded in 1924. Today, Harding offers over 30 academic degree programs, including a master's of ministry online. The MMin is facilitated through the College of Bible & Ministry and is a non-thesis program. The curriculum teaches students effective preaching, community leadership, and conflict management. While the majority of courses are taken online, M.Min students are required to come to the Harding campus twice during their time in the program to participate in the "J-Mester," a week-long intensive and practicum. Through the McNair Scholars Program, students can participate in workshops and seminars, pursue research with the guidance of a mentor, as well as financial aid counseling, career counseling, and personal counseling. Harding also offers several scholarship opportunities, including a full-time ministry award that covers 40% of the total degree cost. Piedmont International University was founded in 1945 to accommodate returning World War II veterans eager to begin Bible studies. Located in Winston-Salem, North Carolina, the school offers a number of distance learning opportunities through its PIU Online platform, including a master's of arts in ministry. This 30-hour degree program is designed for those with experience in ministry who are seeking further ministry knowledge and skills. The curriculum emphasizes apologetics, teaching the Bible, and youth leadership. Students take courses in general academic research and writing, and complete two comprehensive capstone exams during their last two semesters. Piedmont stands out among other institutions offering a master of ministry online for its innovative e4-12 program. Individuals whose church partners with Piedmont can access online course content for only $99 per credit hour; eligible students can pay fewer than $3,000 for their entire master's degree. Located in Collegeville, Minnesota, Saint John's University enjoys a unique partnership with the nearby College of Saint Benedict. Together, the schools provide comprehensive educational opportunities to catholic students and those of other faiths. SJS offers several online ministry programs, including a master's of arts in ministry. The program provides students with foundational knowledge of theological traditions and biblical literature, and trains them to communicate their faith to others. The 36-credit curriculum includes courses in liturgy, systematic theology, history of Christianity, and more. Students choose from five pastoral ministry tracks to personalize their degree, including youth and family minister, liturgical leader/coordinator, spiritual director, pastoral caregiver, and deacon. SJS student may pursue internships and service projects through the school's Experiential Learning & Community Engagement Program or the Center for Global Education. There are several types of financial aid available, including scholarships and assistantships. Every school is different, though all online master's in ministry programs share some commonalities. Some programs will have a more narrow focus on certain aspects of ministry, preparing you for specific roles, while others have a broad curriculum that will prepare you for many roles. Ministry Leadership This concentration is focused on leadership and the skills required to successfully lead within the context of a given ministry. Student learns problem solving skills within an organizational, ministerial context. Prepares people for roles as senior pastors and nonprofit directors. Pastoral Ministry Pastoral ministry is focused on teaching and attending to the spiritual needs of the faithful. This concentration focuses on ecclesiastical traditions. Graduates are prepared for careers as pastors, deacons, and youth ministers. Strategic Ministry It's important for ministries and churches to plan for the future. Strategic ministry focuses on the administrative and "business" side of ministry, developing the skills to help religious organizations deal with challenges while remaining true to their mission and beliefs. Administrative positions within ministry. Master's in ministry degrees online will have some commonalities between their curriculums, but how the content is delivered and what is focuses on may vary. Below, you'll find several sample courses which could be found at a variety of schools. Introduction to the Old Testament: Explore the early, foundational portion of the Bible and develop a better understanding of the meanings of many contentious passages. This is essential to understanding the development and history of Christianity and and how the New Testament builds upon what came before. The Church in Historical Context: Explores the lives and teachings of Christians from the first century to the modern day. Such courses are often split into several sections and cover a specific time period. Coursework helps students understand the context in which certain aspects of faith are developed. Preaching Theory and Methods: Focuses on the art of delivering messages to the faithful through sermons, writings, and other venues. The course explores the construction of sermons and the development of the skills needed to create engaging, thoughtful discussions and teachings. It's important for anyone who wishes to work as a pastor and guide people on their spiritual journeys. HOW LONG DOES IT TAKE TO GET AN ONLINE MASTER'S IN MINISTRY? Most master's in ministry programs can be completed in one to two years. The amount of time you have to dedicate to your studies and how many courses you can take per semester or term can affect program length. Some schools set a very specific program, requiring students to take courses synchronously. Such institutions often group students into cohorts, which has them move through the program at the same pace, requiring more peer interaction than other formats. Others expect students to complete their courses on their own, and sometimes they allow students to take a large course load to finish the program earlier. WHAT'S THE DIFFERENCE BETWEEN A MASTER'S DEGREE IN MINISTRY, THEOLOGY, AND DIVINITY? Ministry, theology, and divinity have different meanings, but they are closely related; degrees in these subjects are related as well. While all are valuable to those wishing to do religious work, they offer different opportunities and focus on different skills. Master's in Ministry: This degree focuses on guiding the faithful and expanding the church. Such programs focus on applying the Bible to daily life and working with others to ensure that the church can work towards its mission. This degree is intended for pastors and others who wish to take a leading role in discussions about faith and in steering the development of the church. Master's in Theology: This degree is focused on studying Scripture through historical, linguistic, or social contexts. Students in this program tend to be more interested in understanding the language of the Bible, how it was developed and how it impacted the lives of historical groups. They do not focus on applying biblical knowledge to daily life. It is a program devoted to “book learning” and often involves some kind of research project. Master's in Divinity: This degree is often seen as a "first step" for seminary students. It grants students a wide selection of skills which can be applied in pastoral roles and secular or academic roles. It opens up a number of career opportunities, such as chaplaincy, teaching, and counseling, as well as non-profit, academic, and pastoral work. Accredited schools have been verified by one or more organizations, such as the Department of Education (DOE) or the Council for Higher Education Accreditation (CHEA). This shows that the schools meet certain standards for higher education. An accredited school is trusted by other institutions and organizations to teach students the skills to succeed in their chosen fields. The most common forms of accreditation are regional and national. Regional accreditation is usually more valuable, and credits transfer easily between other regionally accredited school. National accreditation is most common for vocation and technical institutions. The DOE oversees educational standards for the entire United States and at all educational levels. While each state sets its own specific educational policy, the department sets minimum standards and organizes national campaigns in favor of those standards. The Council for Higher Education Accreditation is a professional organization with members from over 3,000 colleges and universities who work to improve standards of self-regulation and accreditation. They are a body which allows universities and colleges to keep themselves and each other in line with educational standards. You can find complete lists of accredited schools through the DOE's and CHEA's websites. People earning master's in ministry degrees online have a variety of career paths to choose from. An obvious choice is to become a pastor, but some may choose to work within an administrative role at a church. Other options include working in education, counseling, and the nonprofit field. A master's degree in ministry can also be applied to academia, especially for those who study religious history, sociology, or linguistics and wish to research and write. Pastors lead prayer and other spiritual activities and tend to the faithful. They often serve as counselors and advisors to people seeking help. They are frequently associated with nonprofit efforts. The requirements for such roles vary across denominations, but a master's degree is common. Christian education directors manage schools, youth groups, and other educational activities maintained by churches. This might involve Sunday School, primary or secondary schools maintained by the church, or other church-based programs. A master's degree can give people in such a role a significant increase in earning power. There are a variety of organizations that bring together pastors and other religious workers, many of which are organized denomination specific, though there are also a number of non-denominational groups as well. These organizations often hold conferences and offer other professional development opportunities which can help ministers and others to improve themselves and their church. Membership may be considered automatic upon ordination or require application. National Association for Lay Ministry: This group works to provide vision and leadership to lay ministers of the Catholic Faith. They bring together laypeople, clergy, and the vowed religious to share their thoughts and experiences. Unitarian Universalist Association: This group organizes over 1,000 congregations within the Unitarian Universalist movement. They work to help congregations develop and to pursue the social goals of that movement. Association of Professional Chaplains: This organization brings together over 5,000 chaplains to promote their work and improve their practice. They are an interfaith group that's dedicated to chaplaincy care in a variety of facilities, institutions, and organizations. Paying for an online master's in ministry studies can be difficult. Anyone considering such a program should explore the Free Application for Federal Student Aid (FAFSA), which can help locate student loans to pay for college. There are also scholarship opportunities provided by individual schools and by professional organizations like those listed above. A good place to begin is by talking to an established pastor to find out how they paid for their education.